Zaimah is a Partner at our Kota Bharu branch office and heads the office’s Motor Insurance Department. Zaimah advises clients on third party claims, fraudulent claims and denial of collisions, subrogation claims, intervener applications, declaration proceedings and all related matters under the Road Transport Act. She has represented her clients in claims exceeding RM 1 million and has appeared before various levels of Malaysian courts. 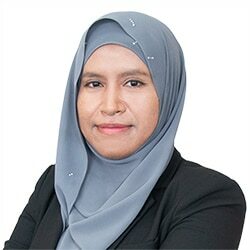 Zaimah Hussin joined Zaid Ibrahim & Co. (a member of ZICO Law) in 2017 and became a Partner in 2019. Prior to joining the firm, Zaimah was a junior partner at Othman Hashim & Co.